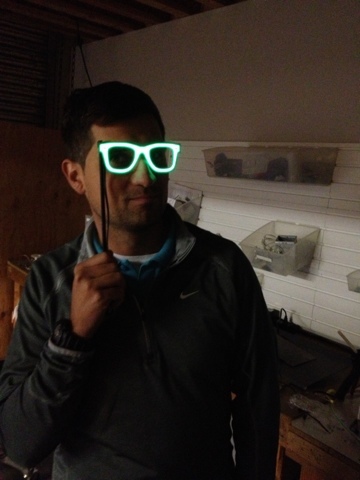 Ellumiglow Lighting Technologies Blog: Check out the Green Glowing Raybans at the Oregon Ducks Game! Check out the Green Glowing Raybans at the Oregon Ducks Game! Our brand new EL Disguise is taking Colleges, parties, tailgating and fun to a whole new level! These unique disguises on a stick are a great way to be noticed, or un-noticed, depending on who you look at it. Have fun with friends, family or spice up the photo booth with the new EL Disguise!